Getting accepted into an anesthesia residency program is one of the final and most important steps involved in your anesthesiology studies. The right residency program can make all the difference in how successful you are in your medical career, which is why you want to have what it takes to get accepted into the best anesthesia residency programs in the country. And our residency personal statement editing service can help you. When applying to these anesthesia residency programs, it is important that you submit an application to the admissions boards that will stand out and get you noticed, so you can prove that you have what it takes to be successful in one of these highly competitive programs. The key to standing out with your anesthesia application is to write a personal statement for residency that is engaging and will show a program just how successful you can be. Where Will You Apply for Your Anesthesia Residency? Massachusetts General Hospital: their aim is to ensure that you receive total excellence in the training that you receive through their program. Stanford University Medicine: this is one of the top-ranked programs in the country and will be able to offer you training that is simply second to none. University of California San Francisco: this program seeks out the most gifted residents and is able to offer training across 6 different medical centers. Johns Hopkins: their residency program will ensure that you significantly exceed the requirements for the number of different types of cases you will need to work with. University of Pennsylvania: this program can offer you clinical rotations for your education as well as research opportunities. Duke University: boasts some of the finest facilities as well as offering an unequalled opportunity to develop your skills in this area. 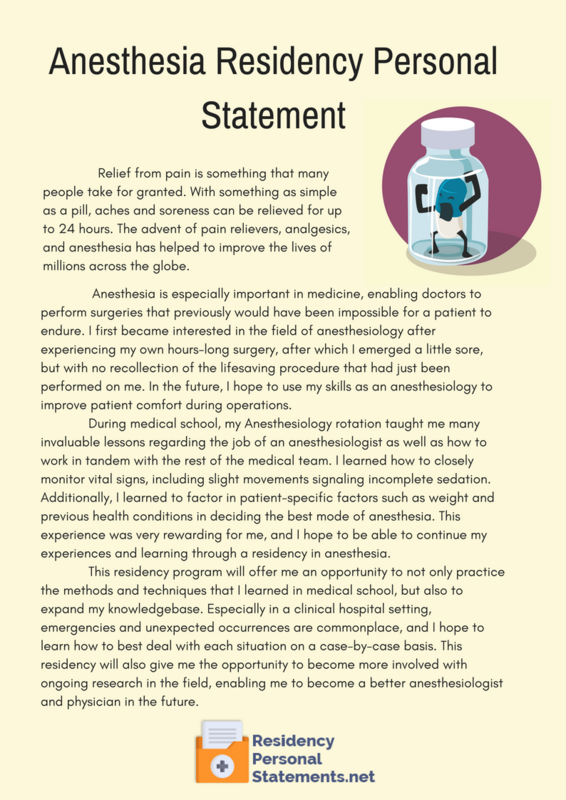 How Should You Structure Your Anesthesia Personal Statement? Why you are studying anesthesiology: you need to give the reader a good idea of why you have decided to follow this specialty and the steps that you have already taken in this direction. What makes you a good anesthesiologist: you will need to highlight your most important qualities and skills that make you particularly suited for this route. What are you looking for in the residency: cover the areas that you are particularly wanting to understand and learn about. Your future career: they will want to see that you have clear plans for your future and know what role you will be looking for. Standing out from a sea of applicants with your anesthesia residency application can be difficult, but with the right personal statement, you can get the extra attention you need to get accepted into the program. We know how important these statements are, which is why we offer professional writing services aimed specifically at those looking to get accepted into anesthesia residency programs. We can help you create a quality anesthesia residency personal statement that will stand out, highlight your personal traits and show any school why you are capable of success with their program. Our company not only knows the importance of the personal statement for research fellowship but we know what it takes to create the right type of anesthesia personal statement and we can create a statement just for you. We can do this because we have a team of writers on our staff who are ready to take your ideas for a personal statement and transform them into a compelling, high-quality essay that will get the attention you are looking for from the admissions boards. Our writers can help you create any type of essay or simply take an existing essay and edit it so it truly shines. Turning to our anesthesia residency personal statement writing services means turning to true professionals for essay writing help or professional help with personal statement for residency. We not only have some of the industry’s most experienced writers on our team but we also have a team of friendly customer service representatives that will help make sure that you have all of your questions answered and that you are getting the personalized attention you need. 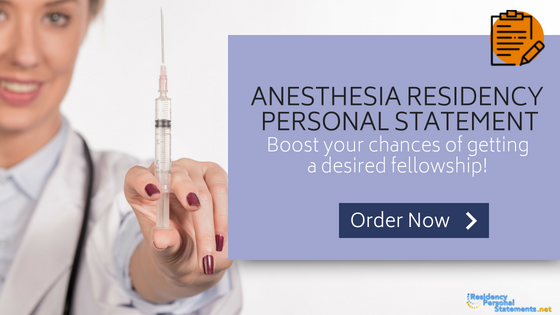 Guarantee that your anesthesia residency personal statement will be delivered on time. Guaranteed original writing and all statements are delivered with a plagiarism report. Guaranteed complete confidentiality: we never share with other parties. Contact our experts here and learn just how we can help you to get that all important interview and rank you highly with our support for writing your anesthesia personal statement.